To shift the climate change debate from individual responsibility for individual behaviour change to collective responsibility for structural change. It’s important that, where they can, people make individual changes but switching light bulbs doesn’t connect a person with real causes of climate change, the political and economic system. We want to challenges the corporate interest which cause large emissions and which can only be tackled through collective action. We hope this action will inspire more grassroots action tackling climate change and be initial steps towards building a movement of decentralized groups committed to tackling the root causes of climate change. 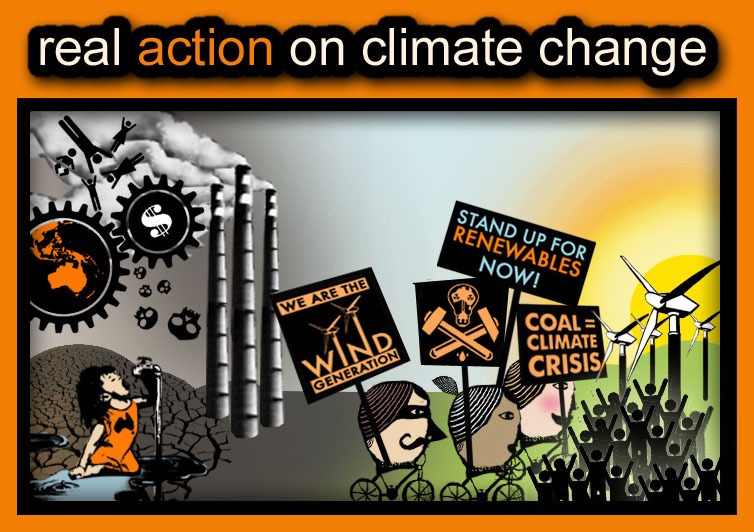 A commitment to direct action; a belief that solutions to the problem of climate change lie not with governments and corporations but with grassroots movements for change. This action is a direct attempt to stop something real; to actually prevent the ability of a power station to produce CO2 emissions, or for coal to get exported, even if only for a few hours. The existence and continued use of fossil fuel (coal or nuclear) is incompatible with any kind of ecological or equitable future. Our attempts to shut down mine, power stations and ports are an audacious strike both at a source of CO2 emissions and a lynch-pin of 21st century capitalism. Our future is too precious to be entrusted to corporate bureaucrats and politicians. An attempt to challenge the pessimism surrounding climate change – whilst reading the science and the increasingly shocking figures, predictions and likely impacts in Australia can leave people feeling crippled. Faced with the full facts about climate change and the massive reduction in emissions necessary over a very short period of time, it’s all too easy to either deny the problem or conclude that it’s too late, that it’s an issue so large and entrenched that it’s without solution. We wanted to move away from denial. We wanted to say that the future is, literally, in our hands. 2. If you do this in China, at best you will be deported, at worst, your parents will receive an invoice for the bullet used to terminate your life. 3. What have you achieved? The answer, more CO2 emission ... from burning needlessly the 60 tonnes off briquettes to keep the 2 boilers firing. The loss of 600MW of electricity over the period that was priced at $64Mwh and the burning of auxilary fuel to maintain boiler combustion stability during the disruption. 4. I wonder if you guys are really interested in climate change or interested in making yourselves feel good. 5. Real Action on Climate Change is LOL ... It is more like Irresponsible Actions on Climate Change. 6. In this age of instant glorification where people want quick actions like the Orange revolution (pun from the color of your tees), you will be disappointed to realised that a lot of persistent low profile smart work behind the scenes result in more effective actions. What you have done will just make you guys look really dumb. 7. Perhaps, have a post-morten review of your activities and get public feedback about your mass media 5-minute fame. I want to say thank you on behalf of all who are concerned about climate change for bringing attention to and directly combating greenhouse emissions in Australia. I agree, the” anti-terror” laws, and indeed our court system, are racist and discriminate against certain demographics in the community (e.g. people that appear to be of middle-eastern background)…But what does this have to do with this action against fossil fuels, aside from highlighting the difficulties marginalised groups have to face if and when they engage in dissent and resistance? Also irrelevant… Except perhaps to highlight the danger of exporting uranium to such a state. Are you advocating this approach? Or are you trying to praise the liberal-democratic model used in Australia? If it is the latter, it seems to contradict what you were saying in your above post. In off-peak periods coal-fired plants create a surplus of energy that is not used. I’m not sure if that was the case this morning, from the reports I heard it was, in which case there was no wasted energy, and in fact by bringing production down surplus was reduced. But regardless, even if some more CO2 emission did occur, what has been achieved? -A dissenting, critical voice in the corporate media that is offering an alternative to the dominant line of “APEC; a great opportunity for the most powerful state and business leaders to make the best decisions for all of us”. -Empowerment for the people who were involved in the amazing action, and a realisation of their own potential when they work together. -A space created for people who are not politicians, business elites or heads of non-government organisations to take meaningful action on climate change. A space opened for people to engage in this issue that is outside the usual paradigm of voting and changing lightbulbs… (this said, relating to your earlier comments that highlighted the difficulty of some groups taking similar action, there is still much work to be done to empower oppressed and marginalised groups… not to mention deconstructing the unhelpful stigmas that prevent people from writing their own future). Why are you making this distinction? I think it’s really interesting that often this assumption comes up that you have to be a martyr to engage in social and/or environmental action… Social change should be an empowering process, and if actions such as these allow people to actually start taking control over their world and their lives and they enjoy that (as anyone would), then isn’t that a positive thing? People avoid big ‘P’ party Politics because it is boring and disempowering, with the vast majority of us reduced to choosing between elites. Grassroots action, and direct action particularly, is about groups of people asserting an opinion on an issue (eg climate change), and making change but it’s also about a process of feeling good about directly participating in decision-making and shaping our society, rather than deferring our power to representatives who have their own interests and agendas. It’s fun, it’s important, it’s necessary for real change. I like the idea of orange revolution, being red-haired and all, and I like that you used the word ‘dumb’ (I also like the word “boring” [see above]). You assume that these actions do not involve “low profile smart work behind the scenes”, quite often the people who ‘lock-on’ during actions become the focus because of their willingness to risk harm and legal implications etc… Clearly these people are important and should be supported and celebrated…. But there are many other people who don’t get the “instant glorification”; support crew, food crew, people organising meetings, minutes, setting up blogs, publicising events, media, jail solidarity etc etc… I think groups that work well know to value and acknowledge and celebrate these people as much as the people who lock-on… Clearly social and environmental change requires commitment and hard work, but again I don’t see why we can’t allow our passion and creativity to manifest in moments of outrage and abandon… Moments that are a display of our power and potential... These moments are important, just as the day-to-day resistance, or “low profile smart work behind the scenes” is important. We need collaboration not competitiveness. Great idea, something like “Direct Action, Elite Decision Making, and Changing Lightbulbs; a Discussion of Climate Change Solutions”… or maybe “Direct Action Against Climate Change; Amazing or Dumb?”… if you would like to organise it and need some help I would be willing to put energy into it.